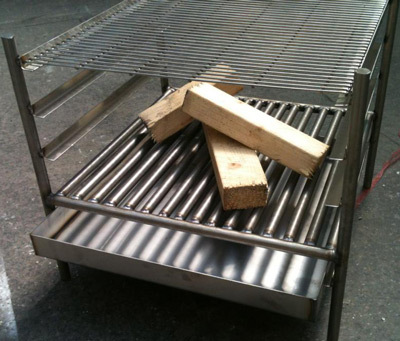 Our stainless steel barbeque grills offer different cooking solutions yet at the same time can be used as a fire pit. When you’ve finished your BBQ and the cool descends over a typical British Summer evening, just throw a log or two onto your fire pit and continue to enjoy your al fresco dining experience. This stainless steel BBQ grill is perfect for use at home or out in the field and with a deep ash pan you can make a hearty campfire too. A kettle hook is screwed into one of the legs, ideal for brewing up or one pot campfire cooking. Three cooking surfaces all with adjustable height. The grill, the hot plate and the warming rack. Well you’ve got all of the above and it looks good too! Each cooking grate is secured with wing-nuts making for easy set up and adjustment. 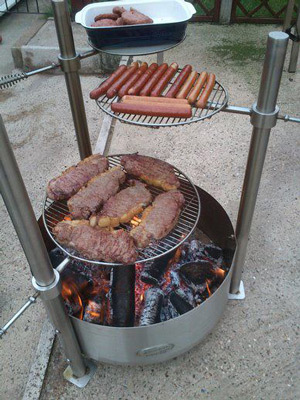 You can vary the height and the cooking grates during the cookout and each grate also spins away from the heat offering a novel way of serving. Constructed exclusively from 304g catering grade stainless steel as you’d expect, the ash pan base is 3mm thick, the legs are 40mm diameter cross section and 800mm in height. 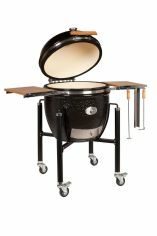 Robust and functional, you can really build a big fire in one of these. Braai is the South African word for barbecue but it means much more than that. It's means building a wood fire, gathering with friends or family and cooking over the hot embers. You get a 16mm solid grate to put the logs on together with a sliding ash pan underneath. As with The Campfire Cooker the ash pan is constructed from 3mm steel and stands above ground so preventing your grass or patio from scorching. When your wood has settled and you’ve got a nice hot ash, slide in the cooking grate at one of the three shelf heights and enjoy! 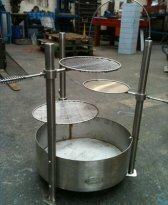 We make these stainless steel barbeque grills in two sizes, 400mm square & 800mm square. Of course if you want something custom made then just give us a call and we’ll be happy to oblige. At the risk of labouring the point, both stainless steel BBQ grills on this page are a welded construction from top quality catering grade stainless steel and both are made in Britain. It's the quality of the stainless steel that makes our grills & fire pits stand out from the crowd and yes it also means that they cost more than a cheap Chinese import. Learn more about the stainless steel that we use and why. Every one of our stainless steel barbeque grills is made to order so as soon as you hit the paypal button and send us your money, we get to work and make your grill. Manufacture and delivery normally takes one week, when your grill arrives it will be flat packed and easily erected in minutes. You grill is designed and constructed to give you a lifetime of fun and BBQ cooking and you will need to take care of your cooking grates. Keep them hygienically clean and your BBQ food always taste better, use our guide how to clean stainless steel cooking grates and stainless steel surfaces.